Pittsburgh is usually not known for being uber-fashionable, some may say that Pittsburgh is a good 10 years behind other cities in terms of our fashion sense. Others are confused by our pro-sports dress code. Only in Pittsburgh is a yellow hand towel considered an import accessory by everyone. But there are some amazing businesses working to make Pittsburgh look better – this weekend both Tula Organic Salon and designer Kelly Lane are hosting open houses where you can check out their work spaces and save big on on their goods. I have had the honor of learning about both of these businesses for some time. I was luck to get an invite to one of the Kelly Lane sales at Kelly’s House a few years ago. Tula Organic officially opened their doors in April – but the idea has been in the works since last summer. Tula’s co-owner, Emily Askin, is a good friend of mine. 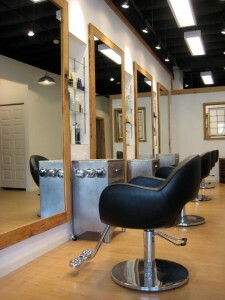 It is so exciting to see their idea for Tula Organic Salon and Spa become a reality. Both of these businesses are hosting open houses this weekend and you should stop buy and say hello. Kelly Lane is a clothing line that is based here in Pittsburgh. Kelly Simpson-Scupelli designs dresses, skirts and tops that are sold around the globe. Kelly Lane clothing is crafted with eco-friendly fabrics and is manufactured in the US. Kelly Lane dresses have been featured on a number of fashion blogs. Check out Kelly Lane’s Galaxy Dress featured in Eco-Salons list of top 10 Holiday Dresses. Read more about Kelly Lane in the Post-Gazette profile of her business from March here.